This versatile 2-in-1 oal is great for honing your shooting skills. The greatest strikers hit their targets with precision and confidence. With the 2-in-1 Target Goal, you can join them. Fine tune your finishing until you’re ready to hit the back of the net on match day. The durable target sheet simply clips onto the goal, providing you with 6 targets to aim for as you hone the accuracy of your strike. The target sheet is easy to detach when you want to switch to a traditional goal. 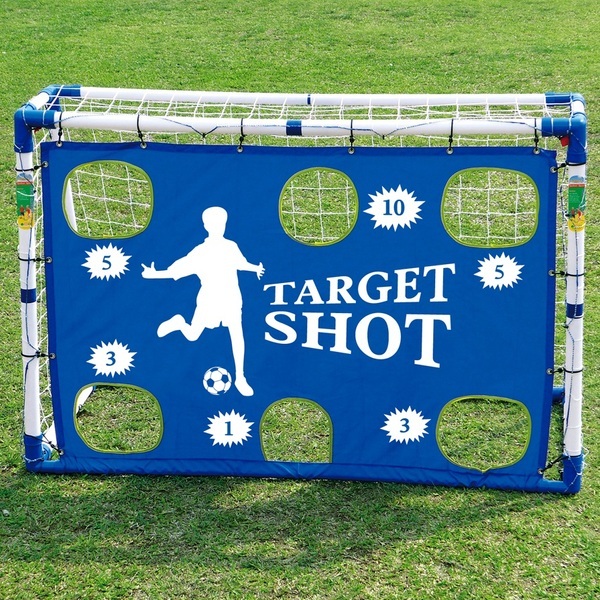 The adaptable and durable 2-in-1 Target Goal bringsprecision to back garden kickabouts. Have fun improving your shooting technique, and you’ll be well on your way to becoming a goal- scoring legend. The 2-in-1 Target Goal features screw-fix joints for extra durability. This goal is fully portable and convenient to store, so you can easily transform your garden from lawn to pitch and back again. The 2-in-1 Target Goal is designed to make football training even more fun. Football, like other team sports is a great way to develop competitiveness and teamwork while staying active and social.